How do I substitute ingredients and where to buy them? Some of my recipes include helpful advice, addresses, and links that will help you to purchase and to find certain products. Please keep in mind that our website is no advertisement or sales page, the provided tips and info’s simply serve as a helping hand to make things easier for you. I would have been very grateful if I would have had those information’s back when I have started. A website with these valuable, healthy and tasty recipes simply didn’t exist. But now it’s very easy for you and to be honest, this is how it’s meant to be;-) I personally buy my ingredients and products in different stores. For example, in natural food shops, on the organic, weekly market, and in well-equipped supermarkets. In our region, it’s a supermarket called Edeka. I must say that this supermarket chain is very well equipped and they offer a vast variety of vegan & organic foods as well as sugar/ gluten-free products. I usually buy my organic rice waffles at Aldi “Gutbrot” because they taste really crunchy and very tasty. Please note that you should always seal the rice waffle bag very well after taking one out because if you don’t your rice waffles will taste like Styrofoam very quickly. ;-( Other gluten-free products like rice, buckwheat, quinoa flakes are available at health shops, natural food stores or at Müller. I personally ordered many things online as well at times where I simply had no time to go to a supermarket. Meanwhile, there are many really good online suppliers that offer gluten-free products. Companies like Querfood, Hammermühle, Werz (Now Wangenmühle), “glutenfreigenießen”, “Seitz-gluten-free”, or Fa. Bauckhof to name just a few. Or you can simply order many products via Amazon. But please always check the ingredients first! Here are some infos about our beloved pasta. We usually buy our pasta from the company “Schär” and as far as I can remember we have been one of the first customers that ordered gluten-free pasta 20 years ago. The only difference is that the variety was really small compared to now. And nowadays we don’t even know what to choose anymore since there is such a vast variety;-) But there are many more companies that offer gluten-free pasta. And since all tastes differ, I simply suggest to try out all of the different companies. You can find gluten-free pasta in all natural food stores, health shops, Müller market, in well-equipped supermarkets, on weekly markets, and on the internet. There is just one thing you have to know about gluten-free pasta: They need LOT’S of space like to swim in LOT’S of water and they require a much shorter cooking time than for example wheat noodles. If you don’t consider this you will most definitely get a mushy mess on your plate;-( Unfortunately, I had to experience this the first time I cooked gluten-free pasta;-( My tip: Boil up lot’s of water in a big pot, add the pasta and use a timer. This is the best way;-) You’ll find further information about this topic in my recipes. I would like to talk about “organic food* at this point. Just like you, I can only expect a product to be organic if it comes with an organic seal or label. But I can’t really guarantee that since there are so many different organic seals. We can only hope for the best and trust. It is very important to us that we only eat organic meat! You will find some very delicious meat recipes here on my food blog. But these are ONLY selected recipes including organic meat. It’s not really a secret anymore that factory farmed animals are not the happiest and healthiest creatures on earth. These poor animals are stuffed with antibiotics and hormone bombs and we should not be surprised about the growing number of people who are resistant to most of the common antibiotics. Actually, it’s a logical consequence if you eat lots of meat from factory farming! In addition, these animals are pumped with hormones, for them to be as fertile as possible and to be honest I don’t want to talk about the horrible circumstances they are living in. ;-( I find this deeply disturbing, disgusting and alarming!!! If I would go deeper into this topic we all would feel really bad and this is not what I would want for you. Further, I would like to achieve that more and more people choose organic meat and that they consider reducing their meat consumption in general. That would be fantastic!!! My tip: Next time you buy meat at your trusted butcher don’t hesitate to ask him to show you the certificates of the organic farms! Just to be sure. I personally ask for freshly caught fish each time. You should never eat farmed fish! I am aware of the fact that not everybody lives near to the sea, where it is easy to purchase a freshly caught fish. And even there you should always ask where exactly the fish is from! So remember, It’s very important to find out a lot about your food. In case you really don’t have a good fish supplier near to where you live, there are really good online suppliers that can send you freshly caught fish within 24 hours. Well cooled and wrapped. I personally ordered fish on a page called “Lachskontor”, but I must say that there are much more, really good online suppliers! Oh, I even found freshly caught fish at a natural delicacy shop! I can’t really recommend tinned fish, especially tuna since it usually contains lots of heavy metal and mercury. If you react to gluten you will most definitely have to change your diet, since I am sure that you still want to enjoy a tasty bread, a juicy cake, and your beloved bread rolls. That’s why it is so important to know how to substitute certain ingredients through others and where to buy them. First of all: Shop with a conscious mind! To be honest, who would ever think that fries, pudding, beer, mixed spices, fish fingers & soy sauce contain gluten?! Even toothpaste and lip balm can contain gluten. I didn’t know that 20 years ago!! Just for that reason, it is so important to freshly prepare as much as you can by yourself. This is the only way to free yourself from the so called gluten-trap. And if you would like to grind gluten-free cereal at home, please note that you should never grind it in the same mill that you used to grind a cereal that contained gluten! It’s the same for restaurants. Be aware that if you order a gluten-free meal in a non-gluten-free restaurant your meal will most definitely contain traces of gluten since the pots, the pans, and the oven were used to prepare glutenous food before. This information is very, very important for people who are suffering from a serious gluten intolerance!! If you want to buy an instant baking mixture, please always double check the ingredients and if this product shows any label saying: gluten-free! The safest and easiest way to grind your flour is in a natural food shop since they usually own to different mills. If you would like to buy ground flour, you will find it in natural food shops, organic supermarkets, Müller market or online. It got pretty easy to find a gluten-free, organic baking mixture in well-equipped supermarkets. I personally like to shop at Edeka. Edeka offers an impressive variety of gluten-free flours and baking mixtures! If you happen to live in Mallorca you will find a great range at Lo Vegano, Müller, Carrefour, and Alcampo. I need to tell you something about baking mixtures, though: I am not a big fan of them since most of them contain too many additives. There are many food blogs on the internet that almost entirely work with these instant baking mixtures. Sure, the baking mixtures make it really easy, especially when you can’t find the time. But in any other situation, I would not recommend them. You will find a few baking mixture recipes on my blog, though. But these are exceptions because I tested them for you in advance. 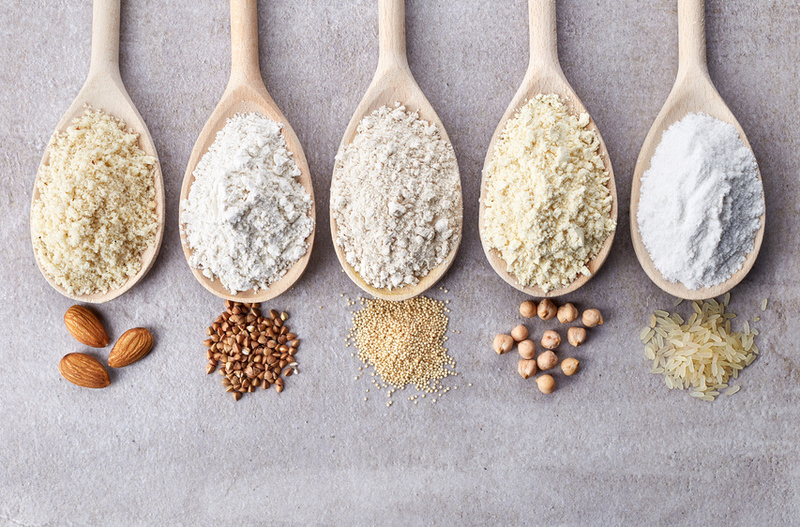 In general, I can only recommend you to work with your test results because this is the safest way and you will be able to create your own flours! And here are the cereal & nut types which are gluten free by nature. Rice, corn, polenta, potatoes / potato flour, buckwheat, millet, quinoa, canihua, teff, amaranth, sweet chestnuts, chestnuts, soy, guar gum, carob gum flour, grape seed flour, arrowroot flour, tapioca, manioc, konjac flour, glass noodles, mung beans, peas, lentils, chickpeas, tiger nut and banana flour does not contain gluten. Unprocessed nut types such as: ” Almonds, cashews, macadamias, hazelnuts walnuts, pecan nuts, peanuts, pistachios, sunflower seeds, pumpkin seeds and Linseeds are gluten free as well. And not to forget sesame, poppy, potato and corn starch. You don’t need to learn this all by heart… sigh;-) This will be your go to, just in case you find yourself looking for different flour types. You’ll find gluten-free oats and oat flakes in almost any supermarket. But: There’s a big discussion if gluten free oats exist at all. And that’s the reason why oats are not part of the “100% gluten-free list”. Nevertheless, you will find some gluten-free oat recipe’s on “Micha´s Kitchen Revolution” since I ONLY buy and use certified gluten-free oats. I usually buy my gluten-free oats from the company “Bauck”. “Bauckhof.de”. Or available at Müller Market, natural delicacy shops, in Mallorca at the German supermarket or at lo vegano. The same applies to baking powder. Not all baking powders are gluten free. The conventional yeast “fresh yeast or dried yeast” is gluten free according to the manufacturers due to mass production. Ecological yeast is bred on a cereal soil and for that reason can not be gluten free!! So please only buy products with a label saying “gluten-free”! You can buy gluten free baking powder at an organic supermarket, natural delicacy shops, on the internet or in well-equipped supermarkets. And here are some types of cereals that contain gluten. These are: Wheat, rye, spelt, oat, barley, amelcorn, small spelt, Kamut, green spelt, bulgur, couscous, bran, semolina & breadcrumbs. 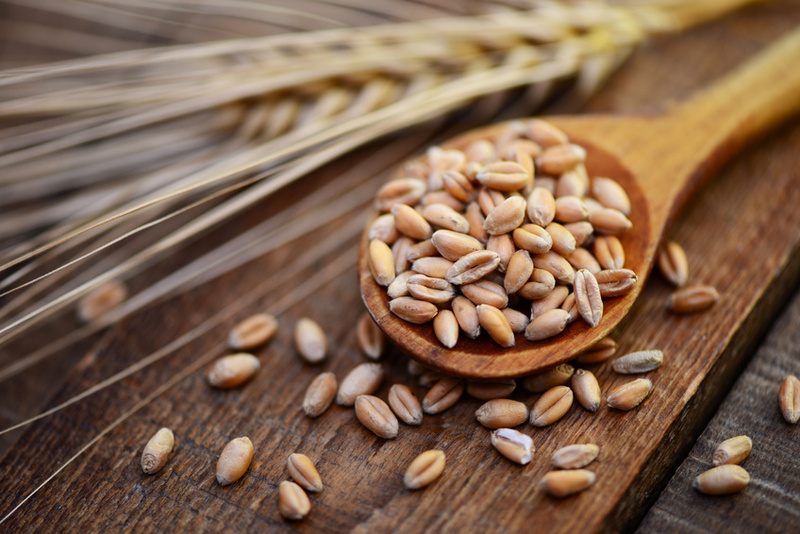 Where is the difference between glutenous and gluten-free products? Gluten contains a sticky protein which binds the dough if it gets in contact with water. In addition, gluten makes the dough elastic and firm at the same time so that all baked goods such as noodles and other tasty stuff don’t fall apart and for them to be fluffy as well. And this sticky protein is missing in gluten-free flours. I would like to recommend you to read the Ralf Meyer interview if you wish to know more about gluten in general! You can find the interview in the main navigation menu above. It is important to know that gluten free flour which is available at supermarkets works much different to flour that contains gluten. The indication of quantity, for example, is always slightly different to the conventional indication of quantity. That’s why it is so important to follow the indication of quantity using gluten free recipes. In addition, it is very important to mention that you should always use fresh and dry stored flours. I basically store my flour types in Tupper-ware. I label them and store them closed in my pantry. This is the best way to keep them fresh. I personally try to avoid gluten as much as I can since I think that gluten can make you fat, sick and addicted. Same applies to industrial sugar! Malicious gossip has it that gluten and sugar can cause cellulite. Mhhhhhh, is that the reason why supermodels usually skip gluten and sugar? Well, I must admit that I am no saint either and even I have my bad days. And it can happen that I eat something that contains gluten and sugar;-) But these are exceptions and I can only recommend you to keep it that way as well;-) But isn’t it always the same? The exact amount creates the perfect mixture and your test results and I will help you on your way! You’ll see, once your familiar with this topic, you’ll notice a big difference following your test results. This great flour got quite popular recently and It is available as a white or dark whole rice flour. White rice flour is very refined compared to other gluten free flour types and is just perfect for cakes, cookies, and bread rolls. Whole rice flour has a slightly stronger flavor and perfect for bread or tasty side dishes such as gnocchi’s or pancakes. You can find some great recipes here on the blog. You can grind rice flour at home in your own cereal mill or in a strong blender. You can buy it in health food shops, organic supermarkets or well-equipped supermarkets. Or simply order both online. Corn flour is made out of dried corn seeds and its consistency is refined. You can prepare tasty cookies, cakes, bread, chips, taco’s & tortillas with it. Popcorn, for example, is made out of the corn seeds. You can even use this fine flour to bind sauces. Polenta, on the other hand, is grittier but you can prepare amazing gratin’s, patties or very tasty polenta cakes with it. I personally love to work with it and the best thing about it is that you can find it in almost any supermarket. There are a few differences though, and you should be aware of them using the different recipes. Because one thing is for sure, not all corn flours are the same. In addition to the normal, refined corn flour there is a wonderful white and yellow corn flour as well, known as “Harina P.A.N”. This flour is pre-washed and boiled before it is grounded. This extra special corn flour is from Venezuela and usually used for arepas, empanadas, pancakes and tortillas. The combination of potato flour/starch and other gluten free flours enables you to bake bread, bread rolls, pancakes, waffles, crepes, and muffins. Oh and mmmhhhhh… delicious potato fritter;-) And due to the fact that these wonderful nodules are so versatile, you will find many recipes that include them. Potato flour is available at natural food stores, organic supermarkets, on the internet or in well-equipped supermarkets. Actually, I think you can buy them in any regular supermarket and the potatoes anyway! Buckwheat has a relatively nutty taste and it’s perfect for all savory dishes such as bread, bread rolls, and all the other rustic baking goods. You can add some buckwheat flakes to your breakfast porridge as well. Unfortunately, this cereal does not work good with sweet recipes, unless you like it sweet and nutty at the same time;-) Buckwheat is available in the form of, flakes, grout or as a whole, peeled corn in every natural food shop, organic supermarket, in well-equipped supermarkets or at Müller. This gluten free cereal is rich in minerals, trace elements, it tastes slightly nutty, satisfies a lot and it’s even known as a beauty elixir. It’s very versatile and you can use it for patties, gratins of all kind, mueslis, bread, flat bread, omelet’s and even for a home made risottos! Millet is available as a corn or ground and you can buy it natural food shops, organic supermarkets, in well-equipped supermarkets or simply online. The gold of the Incas! This superfood is originally from south America and in 2013 it was honored as the plant of the year! Quinoa is a perfect side dish whether you serve it with grilled veggies, fish or meat. You can even bake bread with it or a tasty salad. In a You can even bake bread with it or a tasty salad. In addition, you can make patties, gratins, cookies, muesli or sweets out of this ancient cereal. Quinoa is not just gluten free but it’s alkaline, rich in nutrients, very versatile, satisfies you for quite a while and it’s super tasty on top! You can buy quinoa as flour, flakes, whole grains or in a popped form. It’s available in red, brown, white and even in green. Available at natural food shops, organic supermarkets, in well-equipped supermarkets, online or at Müller. is related to quinoa and I can only say: Be careful, you’ll get addicted! These little, brownish seeds taste so chocolaty that you are tempted to take a bath in them;-) Canihua can be ground, stirred into drinks or you can enjoy it together with your breakfast muesli. In addition, you can sprinkle the seeds over your dessert and you can even bake cakes, cookies, and waffles. Since canihua is not very popular yet, I guess it’s the best to order it on the internet through amazon. You’ll be able to find it in very well equipped natural supermarkets. Don’t get a wrong impression of these little seeds, they are quite powerful! They contain lot’s of energy, they are whole, taste slightly nutty, they contain lot’s of fiber and the oil within is made out of 70% unsaturated fatty acids. These power seeds are available as seeds or in a popped form. You can create the most incredible gratins & pan dishes, fill veggies such as peppers, zucchinis or eggplants with them or simply use the amaranth seeds as a rice substitute. If your intending to bake a bread using amaranth, please only use freshly grounded flour since amaranth tends to become rancid very quickly. The popped version serves as a perfect topping for your muesli or as a coating. Divine!! Available at natural food shops, organic supermarkets, in well-equipped supermarkets or simply online. You can cook chestnuts or as we do it, simply roast them within the oven. But sweet chestnuts are even more versatile. For example: Prepare a lovely puree made of chestnuts and is the flour to bake cakes or bread. Chestnut flour holds up to one year if stored dry and you can buy it at any natural food shop, organic supermarket, in well-equipped supermarkets or online. Soy beans are part of the so-called leguminous plants and they contain 40% proteins, iron, magnesium and they are quite popular since a few years. Cooked, they can be transformed into milk, yogurt, tofu, tempeh and oil. If dried you can process them to flour. Before buying any soy products please make sure they are labeled as organic to avoid any genetically altered products. Unfortunately, soy has a very specific own taste that you need to like. If you like the taste you can bake pancakes, cakes, bread and fluffy muffins with soy flour. In addition, soy flour serves as a great egg substitute. Find out more about it in the category: Egg and Egg Substitutes. You can buy soy flour at any natural food shop, organic supermarket, in well-equipped supermarkets or online. is made out of the guar bean, it serves as a herbal thickener and it’s very versatile. It intensifies the structure and the volume of any of your baking goods and it makes your ice cream even more creamy;-) Use guar seed flour to bind sauces or use it with dip’s, jams or dressings. You can buy the guar seed flour at any natural food shop, organic supermarket, in well-equipped supermarkets or online. The Carob seed flour is made out of the seeds and the husks of the carob tree and the color of the flour is always very bright. It dissolves completely if added into warm water and it changes into a gel after the water cooled down. You can bind sauces, jams, comfitures, dressings and ice cream with it and your baking goods will get a nice structure and volume just like with the guar seed flour. You can buy it at any natural food shop, organic supermarket, in well equipped supermarkets or online. Carob flour or carob powder contains 1% fat and a natural sugar. Carob flour is brown, tastes sweet and like cocoa. For that reason, it serves as the perfect flour for all sweet baking goods. You can buy it at any natural food shop, organic supermarket, in well-equipped supermarkets or online. Usually, you’ll find the one form the company “Rapunzel”. A little tip: It’s always better to ask for carob flour since it is not so well known under other names. This very special flour is made through a longer drying process using wine grapes. It provides any of your dishes like for example pancakes, bread & bread rolls a savor taste and it serves as a perfect coat for fish and meat. Given that you tolerate grapes! It’s available at natural food stores from the company “Alnatura”. is made out of a natural plant from the tropics. This special flour serves as the perfect stabilizer. You’ll be able to bind all of your sauces and fruity sauces with just one pinch. You can buy it at any natural food shop, organic supermarket, or online. is a tasteless starch made out of the manioc root. Tapioca is available in the form of little balls, dried flakes or flour. I usually find it in Asian shops, natural food stores or at Amazon. These little balls serve as the perfect pudding ingredient and the flour is a great addition to my kitchen. I use tapioca in many baking mixtures and I love to use it as a binder for sauces and soups. You’ll find some amazing recipes on Micha´s-kitchen revolution since I love to work with tapioca. order the root and the flour through the link shown above. This very special flour is made out of the so called konjak plant. It’s soaking abilities are legendary, satisfies a lot, contains no sugar and it only provides 12kcal/100g! You should just drink a lot after eating konjak products since it soaks up lot’s of water. It’s available as flour or noodles. Konjak flour might seem quite expensive on the first sight but think that you shouldn’t eat more than 5g a day! There you go! Not that expensive anymore right? ? You can bind sauces, soups, marmalades with this flour, prepare home made noodles *Shirataki* or simply stir it into your bread mixture. Unfortunately, the only konjak flour source is the internet at the moment. Meanwhile, the prepared noodles are available at natural food shops and organic super markets. You can thicken sauces, marmalades, dressings and puddings with this banana flour. Oh and you can bake flat breads and pancakes with it as well! This flour is available at any natural food store, organic supermarket or on the internet. We all know that you can prepare nice spreads, soups and dips’s out of lentils, peas and beans, but what are legumes good for? Well, you can make great flours out of them. Legume flours are perfect for, breads, bread rolls, pancakes, cookies and cakes. The same applies to nut flours.